My friend Bastian Hofmann was flying to Brussels to speak at the PHPBenelux Conference that I organize. I picked him up from the airport, put him in my car and talked to him about his work, the city he lives in and the conference he is traveling to. Bastian works at ResearchGate, an online platform where scientists and researchers can share information. The company was founded by researchers who were trying to solve a problem. Thanks to ResearchGate, scientists from all over the world have been able to work together and collaborated on a cure for certain diseases. They are literally changing the world with almost 9 million registered scientists. Read some of the success stories on their blog. We also talk about Berlin, about the city, the architecture and the impact of the tech/startup scene. He’s been living there for a while now and loves it. In the interview he explains why he loves the city so much. He also talks about the tech industry in Berlin and the startup scene which eventually leads to his passion for technology. His domain of expertise is developing fast websites and keeping them fast. Bastian did a quick shout-out to ReactJS. If you want to know more about the conference, read my behind the scenes blog post. Curious about our conversation? Watch the video. 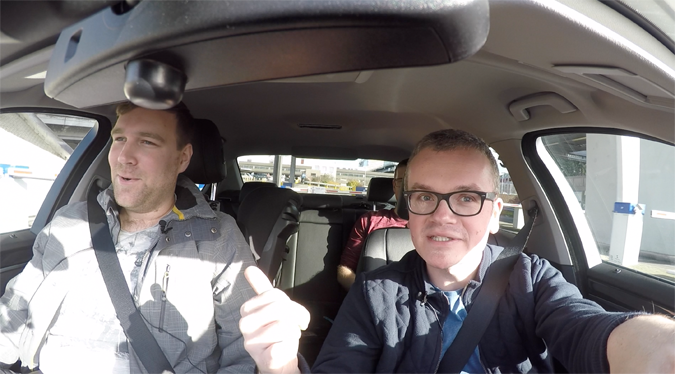 It was recorded in the car on our way from Brussels airport to Edegem for the conference. Thanks to the microphone setup the sound quality is pretty decent. I even managed to filter out some background noise. Check it out! The audio is also published separately on SoundCloud. And you can also subscribe on iTunes. Thanks to Bastian Hofmann for being a great guest. Thanks to Michael Heap for controlling the audio recorder. And thanks to Combell for sponsoring the blog, the gear, the podcast and the Youtube channel.